Gemstone Block of the Month Set - Package pricing is discounted 10%. Designed by the ever-popular Wing and a Prayer Designs, this block of the month is gorgeous. All fabrics are Timeless Treasures Tonga batiks. Finished Size is 92" x 108"
Vibrant Tonga Batik fabrics such as Pearl, Topaz, Jewel, Emerald, Amethyst and Sapphire are the inspiration for this new pattern. 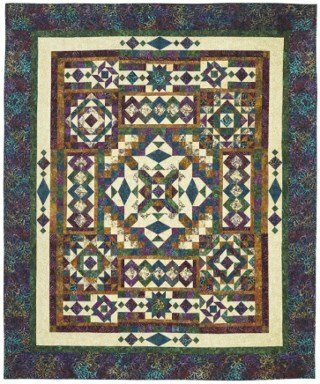 Basic piecing techniques and a variety of block sizes create this stunning Gemstone Tonga quilt. This is a set of 12 patterns and fabrics needed to complete the quilt top including borders and binding. The backing requires 3 yards of Wide back or 9 yards of 44” wide fabric, not included in this kit. Pattern gives King size option. Additional fabrics are needed for King Size. Not included in Queen Kit.